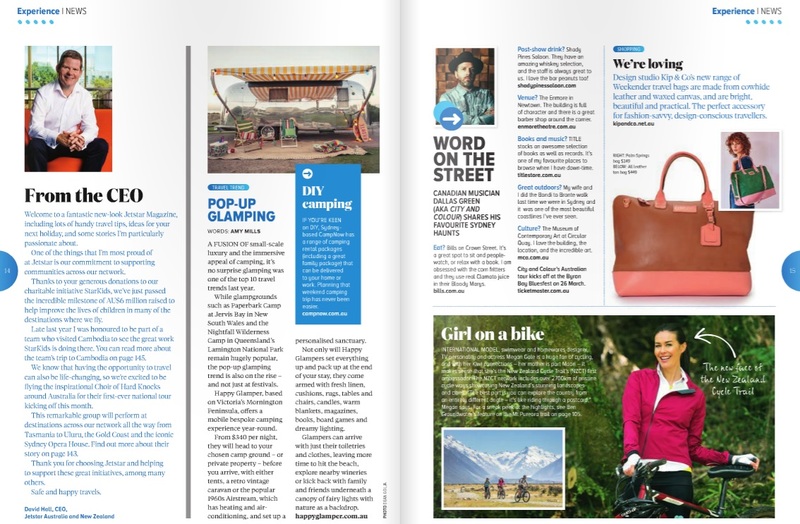 A fusion of small-scale luxury and the immersive appeal of camping, it’s no surprise glamping was one of the top 10 travel trends last year. While glampgrounds such as Paperbark Camp at Jervis Bay in New South Wales and the Nightfall Wilderness Camp in Queensland’s Lamington National Park remain hugely popular, the pop-up glamping trend is also on the rise – and not just at festivals. Happy Glamper, based on Victoria’s Mornington Peninsula, offers a mobile bespoke camping experience year-round. From $340, they will head to your chosen camp ground – or private property – before you arrive, with either tents, a retro caravan or the popular 1960s Airstream, which has heating and air-conditioning, and set up a personalised sanctuary. Not only will Happy Glamper set everything up and pack up at the end of your stay, they come armed with fresh linen, cushions, rugs, tables and chairs, candles, warm blankets, magazines, books, board games and dreamy lighting. Glampers can arrive with just their toiletries and clothes, leaving more time to hit the beach, explore nearby wineries or kick back with family and friends underneath a canopy of fairy lights with nature as a backdrop.